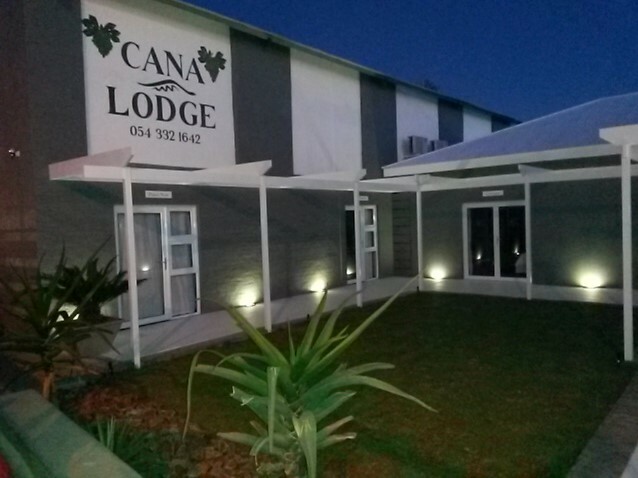 Cana Lodge is situated in Upington, which is surrounded by vineyards in the heart of the green Kalahari and offers the holiday traveller and business traveller a place to relax after a long day. The lodge offers guests a choice of 11 air-conditioned rooms that were named after grape cultivars. Each room is furnished with a double bed and has a private bathroom. The rooms are equipped with a TV with DStv, a bar fridge as well as tea and coffee facilities. The rooms open onto a stoep and they are serviced daily for convenience. Upington offers guests attractions and activities ranging from canoeing on the Orange River, taking a sunset river cruise on Sakkie se Arkie, or visiting the Kalahari-Oranje Museum or the Orange River Wine Cellars. Double, room en suite air conditioned with shower .